OEM Complete Timing Belt Kit. 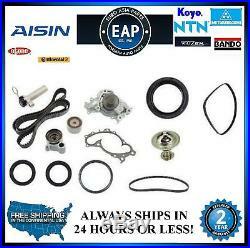 AISIN Timing kit which includes. 11251006034 ---Aisin Water Pump with Gasket. 07851023094 ----Mitsuboshi Timing Belt 07951035 - NTN Hydraulic Tensioner. 22551047--- X2 Stone/Ishino Front Cam seals. 22551052-- KP Front Crank Seal. 67651016-- Continental Power Steering Belt. 67651057-- Bando A/C Alternator Belt. INTERCHANGE (Vehicles this part fits). PLEASE READ BELOW BEFORE PURCHASING! The item "OEM Aisin Avalon Camry Sienna Solara 3.0 V6 Complete Timing Belt Water Pump Kit" is in sale since Thursday, July 26, 2012. This item is in the category "eBay Motors\Parts & Accessories\Car & Truck Parts\Engines & Components\Timing Components". The seller is "euroasiaparts" and is located in Sacramento, California. This item can be shipped worldwide.